This home on today’s featured block was probably built just after the turn of the twentieth century. The block, McGee to Warwick between 39th and 40th, filled with well-off families in the early 1900s. 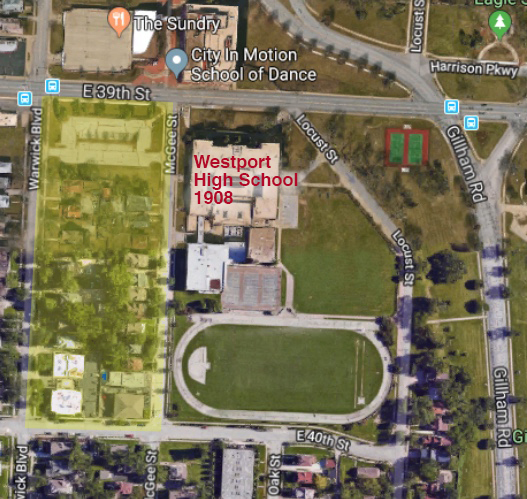 The need for expanded parking for Westport High School led to the razing of some homes for a parking lot on the north end of the block, and apartments replaced a well-known Victorian mansion at the south end. The Southmoreland block between Warwick and McGee from 39th to 40th Streets has seen a lot of history – huge social events packed into its fine homes, a flu epidemic that impacted a funeral, and the ups and downs of pioneer families. Like many areas of Midtown, the heyday of the block came in the early 1900s, when expansion south led to a boom in the building of sturdy homes in Midtown. 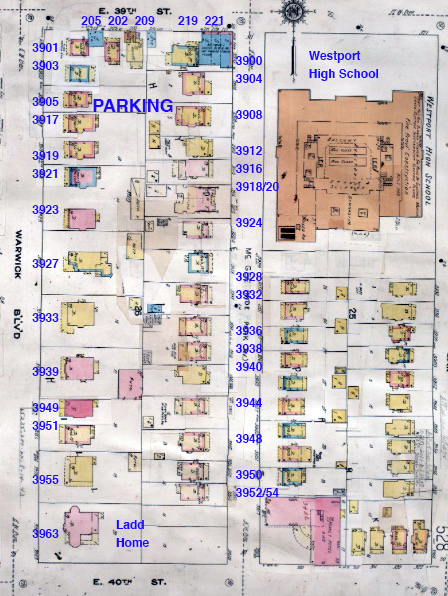 A 1909-1950 Sanborn Fire Insurance map of the block. See the end of this post for a recent aerial view. And like most blocks, many of its homes were chopped up into apartments or even stood vacant for a while until a new wave of households came in the 1980s. As part of our Uncovering History Project, the Midtown KC Post is taking a look at each block in Midtown, including a set of 1940 tax assessment photos which is available for many blocks. (Many people seem confused by the tax assessment photos, which all include a man holding a sign. Here’s the story behind them). This post covers most of the block of McGee to Warwick between 39th and 40th, except for the northwest corner of 40th and Warwick, which was covered in a previous post. A July 17 post remembered the long-time resident of the block, Sanford B. Ladd, a lawyer and prominent philanthropist, who often hosted parties. A Kansas City school was named after Ladd, and while he lived, students from the Sanford B. Ladd school were known to bring him birthday greetings at his big white house. The house at 3959 Warwick has now been replaced by apartments. A few doors north of Ladd, A.D. Cottingham, called the largest horse and mule dealer in the world when he died in 1915, lived a “palatial home” built in 1907. His widow sold the home,3939 Warwick, to the Methodist Episcopal Church. During their years there, Bishop Ernest Lynn Waldorf and his wife were famous for their huge parties. She once hosted 1000 Methodist Episcopal Women from 35 foreign countries, part of her work with a missionary society. How did she fit so many people, and host 60 to 100 guests for dinner, even in this large space? Mrs. Waldorf once explained it to a reporter. In the linen closet there were always more than enough tablecloths and napkins. When large group came, they moved all the furniture from the first floor to the third floor, and the meal was served on small tables. After dinner, everyone went to the third floor, an open space that had one time been the children’s play room. The Methodists sold the home in 1941 and by 1977, it had been converted to apartments. Further up the block, Emma G. Wheeler made the news in 1927 when she led a protest by Warwick residents. They resented having to pay for repaving the street, which they said was broken down by bus traffic. As the protests continued, some residents suggested the busses should be moved off Warwick completely. There’s another interesting tidbit associated with the Wheeler house at 3927 Warwick. In 1929, a wealthy fellow name Richard Jones of the Mission Oil Company died while living with the Wheelers. He left a large estate of more than $100,000 – and a will that provided $5000 for fresh cut flowers to be placed daily on his burial spot at Forest Hill Cemetery. Lucy Parrot, a Kansas City soprano who used the stage name Laura Sonderson, was playing in a musical comedy company in 1910 at the Shubert Theater. She lived at 3924 McGee. From the 1930s to the 1960s, Parrot taught piano and harmony in a home studio. In 1918, a Mrs. Hanna held a funeral in her home at 3923 McGee for her son-in-law, the pioneer real estate man A.A. Whipple. But because of a flu epidemic, health officials had limited how many people could gather in one space. The mourners stood on the lawn with heads bared while the services were in progress in the house. 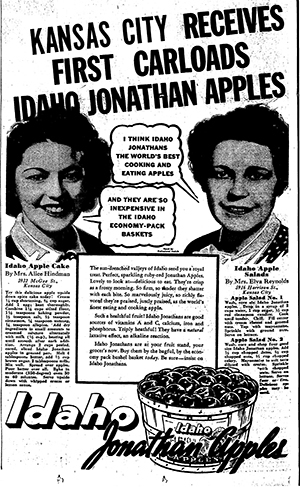 In 1938, Mrs. Alice Hindman, now the resident of 3923 McGee, had her fifteen minutes of fame when she shared her recipe for an apple cake. The Rice family built the home at 3954 McGee in 1901 and lived there for 42 years. By 1958, it had been vacant for 10 years and a family member explained he could no longer keep up the home. 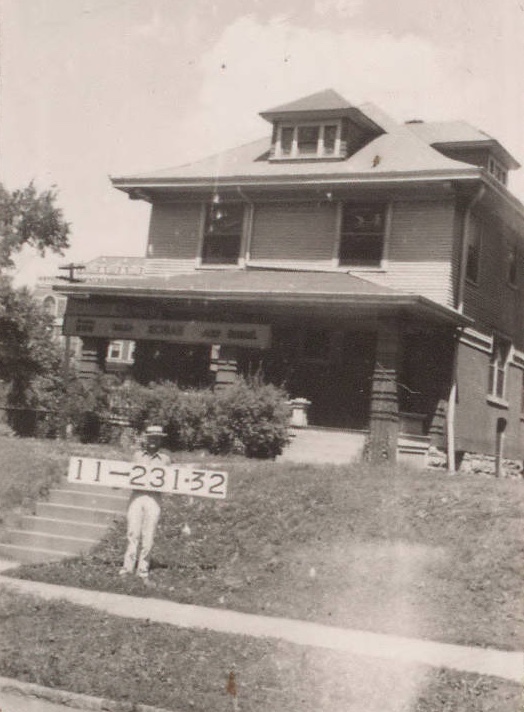 This slideshow shows the homes on the block as they looked in 1940. Our book, Kansas City’s Historic Midtown Neighborhoods, is available now. Contact mjdraper@midtownkcpost for details. Let us know if you want us to come to your neighborhood association or organization’s meeting to share what we’ve learned about Midtown neighborhood history and tell your members how they can help preserve Midtown history. A recent Google map of the block. Love all old history. The commentary on MIDTOWN/Kansas City history is so interesting. Thank You for sharing! I really enjoyed this particular Midtown commentary since I lived at 43rd. and Warwick between 1947 and 1952. I attended Rollins Grade School and Westport High School during this time. Many of my classmates lived in the areas already described and I still have many fond memories of this entire Southmoreland area.